Spring is the season of new beginnings. Fresh buds bloom, animals awaken and the earth seems to come to life again. 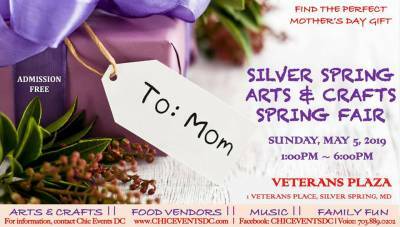 As we are welcoming this season, we are opening our 2018 Festivals and Fairs with the annual Silver Spring Arts & Crafts Fair at Vetrans Plaza downtown Silver Spring, MD! Because the event takes place one week before Mother’s Day, this will be the perfect opportunity to find the perfect gift for mothers.